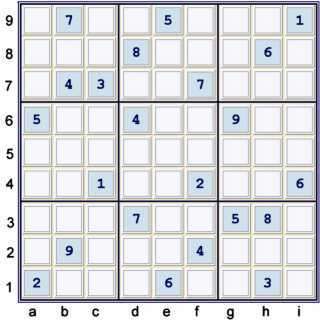 The following is page one of an illustrated proof for the sudoku.com.au tough puzzle of 01/30/08. 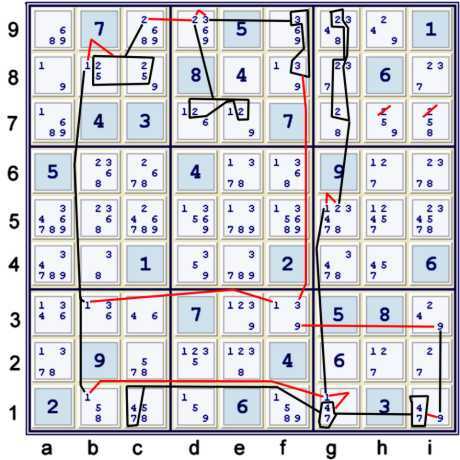 This particular tough puzzle presented some perplexing challenges. I found many, many potential steps. This proof illustrates those I deemed either important to the proof, or just plain interesting. 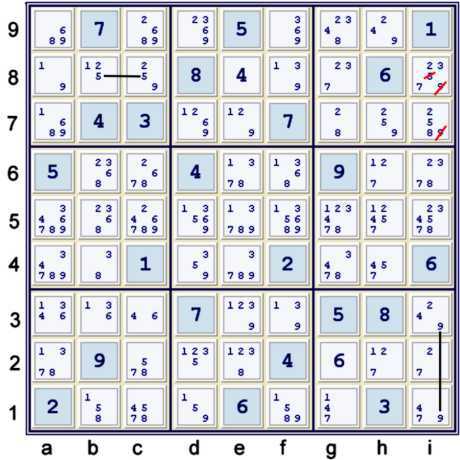 Hopefully, some of the Sudoku tips, tricks and strategies used in this solution will be found helpful. Previous proofs and solutions have been heavy in the proof department. However, I have failed to provide much insight in how to locate complex chains. 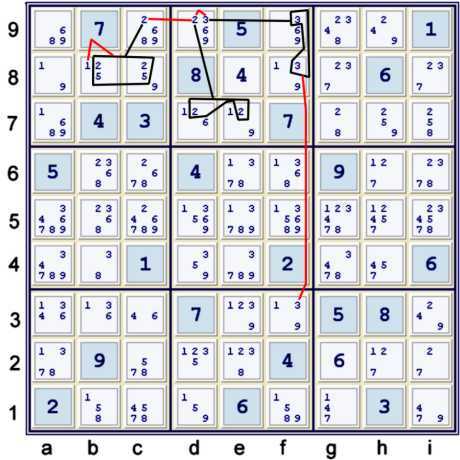 Although I have described my preferred puzzle mark-ups, I have not really spent much time describing the process that takes the puzzle marks and produces deductions. With this proof, I shall endeavor to describe the process of finding deductions in much greater detail. Unfortunately, the ride might be bumpy. Some of my deductions come from mentally jumping from one area to another. The process is definately not straightforward. 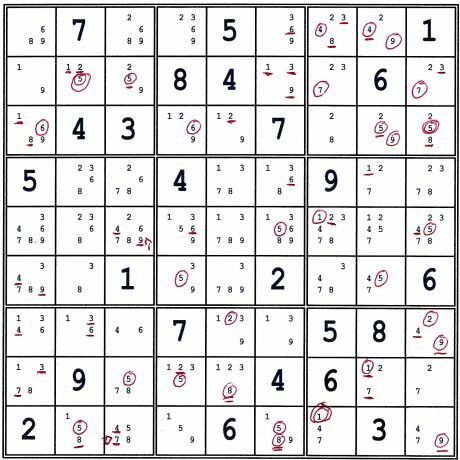 This puzzle has only five bivalues, and relatively few bilocals. No obvious bivalue-bilocal Alternating Inference Chains (AIC), (also forbidding chains) that yield an elimination exist. Given this dearth of immediate fruit, I note that candidate 5 is particularly strong. Box h8 (also called Box 3) is heavily populated with strengths. I then mentally catalogue items not listed well on the mark-up. After the puzzle mark-up, I explore some chain snippets. I try to do this rapidly, and not too deeply. This allows most of the snippets to remain in short term memory. Two short snippets lead to a relatively shallow elimination, shown below. Of course, one could reverse engineer the snippets to produce the sis:[(9)f8,(9)h7,(6)d7] which is slightly stronger. I do this reverse engineering in my head to determine if further eliminations may exist within a pattern. However, during the initial search, since no target has been determined, the more general snippets are often better. The more specific snippets will fall out if they are required anyway. To the already considered snippets to link them. Either way, (2)g789=(2)de7 => hi7≠2. I wish I could say that I was able to immediately see the link between these snippets. I did not. Instead, even after mentally noting these snippets (and many others), I did not see the elimination. Instead, I suspected that something was going on regarding kraken cell (139)f3. Thus, the search began with looking at the Kraken cell (139)f3. Mentally, I built a group of matrix counts from that cell. Below, find the applicable links that I used, and the order in which I considered them. The matrix below does not prove anything, but is merely a reflection of what the link counts mean. Above, I have counted myself into a 12x9 matrix. Thus, my count is +3. However, it can be easily fixed. (1)g1 needs to be in a top position. This is because I am using its weak link in two dimensions. Another way to look at the same idea is that clearly (1)b1-(47)cg1 is not a native weak link. Nor is it a derived weak link in evidence. It may in fact be false. If (2)d9 becomes a top column item, then the matrix count is reduced by 1. If (2)de7, (2)g789 are placed in the result column, the matrix count is reduced by 2. Below, find the Mixed Block Matrix (MBM) that I could build from the link counts. Note the use of the symmetric pm of almost hidden pair 47. Typically, one can dodge one of these. With this step, however, since there are almost hidden pairs used in each snippet, one can dodge using a symmetric pm with the matrix on only one side. Of course, one can write a Block Triangular Matrix to do the job. In fact, in might look exactly the same. 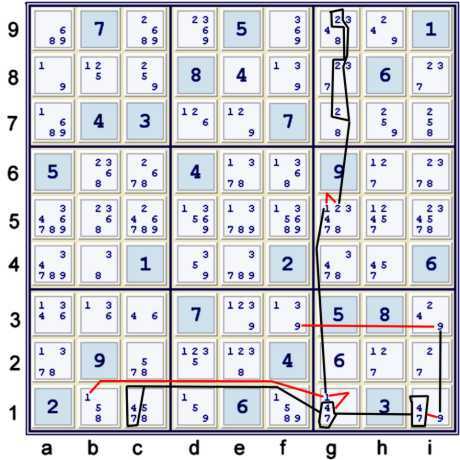 In eiher case, the overall difficulty is no greater than a simple triangular matrix if one thinks in useful groups. In other words, treating the hidden pair 47 as a single Boolean that must exist in at least one of gi1. Since I am densely (puns are a low form of humour) explaining these steps, it seems perhaps that I should end this page here. Not much has been accomplished yet to unlock this puzzle. However, some groundwork has been laid. The first step on the next page is one of my favorites. Eventually, I will get around to making page two.